The planet Venus, the Ring Nebula, the Andromeda Galaxy (and companion galaxy M32) and the Hercules Globular Cluster were all worth the crisp autumn air. Much thanks to that air there was relatively good visibility for the Kansas City metro area. As such, it was time to break out the 6" refractor once again and give my T-Ring to Nikon camera adapter a whirl. In summary, the evening went well even though it was quite chilly. After getting things up and going I started out by snagging a few, less than impressive, shots of Venus. Then as it darkened up a bit I set my eyes on getting some better shots of what I could easily find around the night sky. Especially for my first photography session ever using a DSLR. I started with M57 the Ring Nebula which was a great site when it popped into view after a simple 4 second exposure! Once I'd finished here I thought I'd try for something a little more elusive but still a sure thing if I could star hop to it. 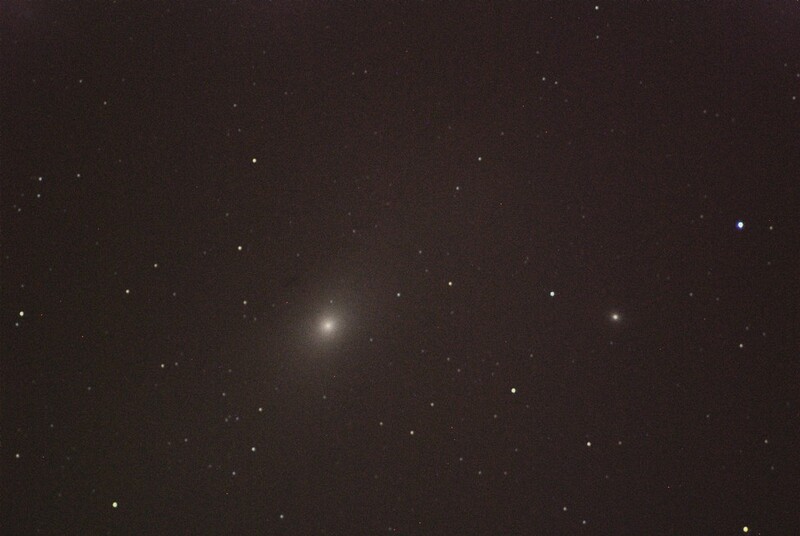 Sure enough I was able to get M31 the Andromeda Galaxy as well as one of its companion galaxies (M32) in the frame. I managed to capture several really good shots with most of them (before processing in some cases) showing the dust lines of the galaxy's spiral arms. I did not expect to see this detail. After these I headed for one last, easy to snag, object, M13 the Hercules Globular Cluster which my mount failed to properly find earlier in the night. Once I star hopped to it I was able to snag some really great shots of it before calling it a night and comping back here to process and post the results. Hopefully you guys can enjoy the images as much as I enjoyed taking them! After some hand wringing and a lot of consideration I decided to snag a new scope (well, new to me). Mainly this was driven by the upcoming Comet ISON visit as well as the ability to use the scope (with proper equipment) for lunar and solar viewing. Not to mention, once it's cleaned up and tweaked, some light astrophotography. Since this is only the second scope that I've ever actually owned, and this one being a rather large one by many standards, I thought it would be appropriate to capture the unboxing ceremony. Meade 6 Inch Refractor Arrives! After Comet PanSTARRS lack-luster debut everyone was happy to have another hope for a great comet show this year in the upcoming visit of Comet ISON (Formally designated C/2012 S1 ISON). This comet was discovered on the 21st of September, 2012 by Vitali Nevski and Artyom Novichonok using a 0.4-meter (16 in) reflector belonging to the International Scientific Optical Network (ISON) in Russia. Although extremely dim at this point, around 12th magnitude (in dark skies we can see down to around the 6th magnitude), there is a chance that the comet will begin to brighten substantially enough to become a naked-eye comet. Early reports suggested it could become the best comet to see this century, but lately those statements have been pulled back and most observers are taking a wait-and-see stance. Currently, for those of you with telescopes large enough to capture 10-12+ magnitude you should be able to start poking around the morning sky for the comet as soon as you'd like, it looks like approximately 5 to 6 AM CDT in the morning. The comet will be passing near Mars, and angularly near the Moon, in the morning skies over the next few weeks. For naked-eye observers or those with smaller telescopes you'll probably need to wait a few more weeks to try to locate this comet. Based on information I've been able to dig up so far it looks like the first week in November from around 4 to 6 AM CST will be the best time to catch the comet and it could be a much brighter 6-8 magnitude at that time. 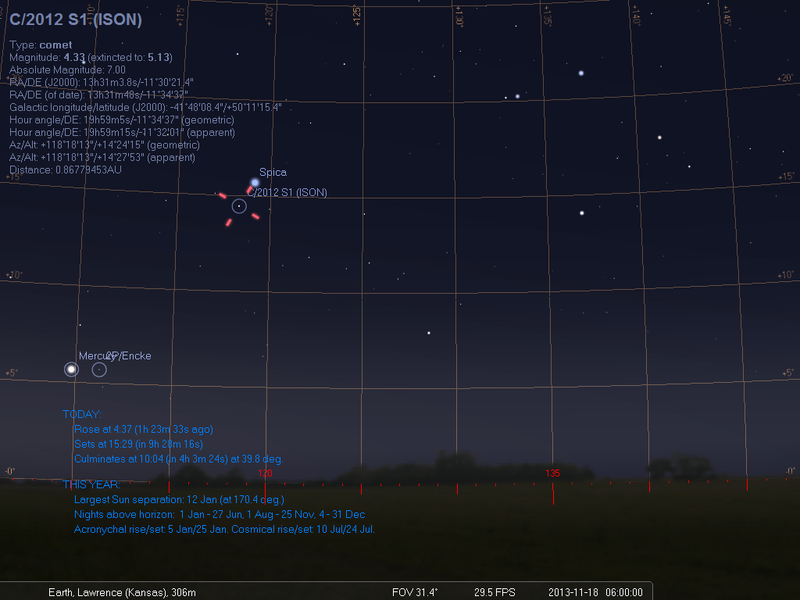 As the month of November progresses your ability to see the comet should improve through the late part of the month. Morning observing will probably be possible up to around November 20th, maybe a day or two past. Around this date the comet will be too close to the horizon (because it's getting ready to be sun-scorched) and the next opportunity will be after it rounds the Sun on it's way back out of the solar system with it's closest pass by Earth, at approximately 40 million miles, happening on December 26th. 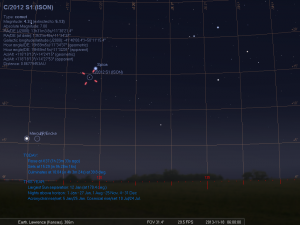 Based on the information I've been able to gather from resources and through using Stellarium to plot the location, it seems that the time around November 18th (see image below, click for full image) will be ideal since the comet should be brightening at that point and not yet below the Eastern horizon. Once it finishes out the swing it is possible that the comet will remain easily visible into the month of January. I'll be posting updates and any pictures I'm able to capture as the month goes on. Happy comet viewing!